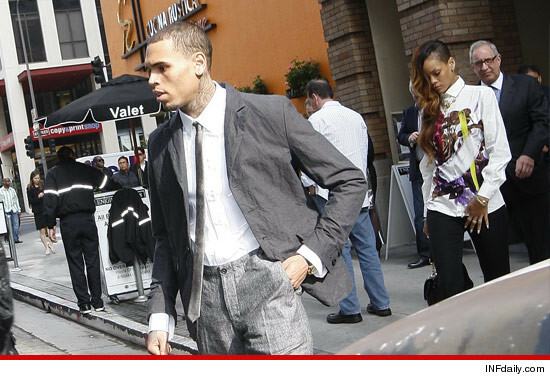 Chris Brown Shows Up To Court With Rihanna! And now, the most shocking development yet in the Chris Brown probation saga……. HE SHOWED UP TO COURT TODAY WITH RIHANNA!!!! Brown and Rihanna— the woman he was convicted of beating in 2009 — arrived to the L.A. Courthouse together Wednesday afternoon where Chris faced allegations that he lied about completing his community service. Rihanna sat quietly in the gallery with Chris’ mom as Brown and his lawyer Mark Geragos told the judge the singer did nothing wrong. Now say he’s not pimpin! This entry was posted in Gossip and tagged allegations, Chris Brown, community service, Court, lawyers, lied, Los Angeles, Rihanna, together. Bookmark the permalink.